Bhubaneswar: The first Museum Walk at the Odisha Crafts Museum, Kala Bhoomi, Gandamunda today saw an encouraging footfall of 70 visitors on the introductory event this afternoon. Senior citizens, working people, students, school goers and even kids were part of this interesting walk, which is conceptualized for the first time in Odisha. Already the heritage walk under the tag Ekamra Walks has given a push to the culture enthusiast a reason to celebrate the rich tradition of the state as it was known for art and craft, since time immemorial. The galleries at the museum mainly constituted terracotta, traditional painting, wood carving, stone carving and temple building, metal crafts of bell, brass, dokhra and silver filigree, natural material crafts, Pipili appliqué work, tribal craft, pre weaving technique gallery and handloom gallery. There is a workshop, amphitheatre and cafeteria. 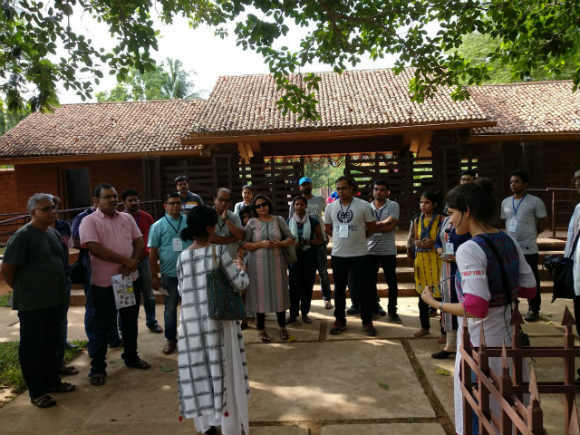 Courtyard was filled with live music today near the beautiful water body with tabla and flute recital and a performance of Sambalpuri dance at the amphitheatre, which was enjoyed by all walkers towards the end of the walk. Saneeya Singh from the museum guided the visitors while archaeologist and co-founder of Viraasat-e-Hind Foundation Jitu Mishra explained the visitors about some of the displays and other aspects of tribal life and sociology. The inaugural walk was held at the newly-inaugurated museum for handicrafts and handlooms at Talabania near Gandamuda, along the Pokhariput-Khandagiri Road. However, every week the Museum Walk will be held on every Sunday between 3.30 pm and 5 pm. Museum walk would be an important activity to create awareness among people about the history and culture of Odisha. It will motivate tourists, and local population to visit rich cultural, archaeological and architectural sites. These experiences also have the capacity to sensitise local population and in turn to preserve and conserve their own culture and heritage. Through this, a sense of pride is inculcated and people start appreciating their heritage. Museum walk is also one of the mediums to initiate community based efforts for conservation and preservation of heritage, art and crafts. 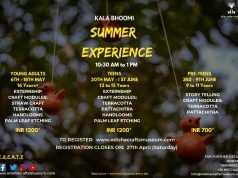 The museum walk at Kala Bhoomi is an initiative by the Bhubaneswar Municipal Corporation, Bhubaneswar Development Authority, Odisha Tourism along with Handlooms, Textile and Handicrafts Department. The event would be curated by Detour. The Odisha Crafts Museum celebrates the craftsmanship of our artisans by putting on display their breath-taking masterpieces to the world. Divided into eight separate sections, the museum has tried to encapsulate the living traditions of a multitude of cultures residing in extreme corners of the State. The architectural style of the edifice is an imitation of the traditional Odia type of household, with similar courtyards and corridors connecting the galleries. Odisha Crafts Museum is the first of its kind to be established in the State. With its chief purpose of promoting state crafts, the museum will also serve as a repository of ageless artefacts from all districts of the State. The entire property of 12.68 acres has been aptly named as “Kala Bhoomi” referring it to be a significant cultural hub of the city. Meanwhile, the 28th Monks, Caves and Kings today at Udayagiri and Khandagiri attracted more than 20 participants and majority of them were women. Students, working women and school going girls were the major participants today as the summer holidays are still in force.